We live in an age where politicians seek to claim the future by harking back to the past. UKIP present us with a return to a time when Britain stood alone and aloof in the world and the only foreign workers were at a safe distance, in far flung corners of the Empire. The coalition government, under the guise of financial probity, seeks to shrink the welfare state and invoke a positive image of an age of austerity. There are few people who lived through the inter-war years of the 20th century, now articulating their experiences. One who is, though, is nonagenarian Harry Leslie Smith, a staunch defender of the welfare state. In his recently published book, Harry’s Last Stand, he details the grinding poverty of life before the state’s safety net existed. Reading Harry’s book made me think of my own father’s life. Had he not died in 1999, he would be a similar age to Harry. He was born in 1922 in Deptford, south-east London, the only child of an Irish mother and Scottish father. His parents had both come to London with siblings to escape the poverty of their homelands but discovered that life was only slightly better. They lived in two barely habitable rooms and his father worked, with little job security or reward, in the butchery trade; there was never enough work or food. When my father was a baby, he contracted polio. The doctor, that they had to pay to visit, said that he would probably die – an older infant sibling had previously succumbed to the disease. But his mother nursed him with drops of brandy and he survived - a withered upper arm being the permanent reminder of his narrow escape. When my father was 15, his father died. A stomach-ache, that they could not afford to be treated by the doctor, turned out to be peritonitis. His mother, working in a variety of badly paid menial jobs, needed my father to work as well so they could support themselves. Then, during the Blitz of the Second World War, his mother was killed. She had been fixing the blackout curtain to the window, when an unexploded bomb from an earlier raid went off in the ruins of a house opposite. She was thrown across the room and had seemingly survived, but died two days later from internal injuries. His Aunt, not having heard any news from her sister during the bombing, travelled from safer south-west London to find her 18-year-old nephew had been sleeping through air raids under the kitchen table, alone in his damaged home. Taken in by his Aunt, he then joined the RAF and survived the war despite being sent on countless raids as part of the crew of Lancaster bombers. 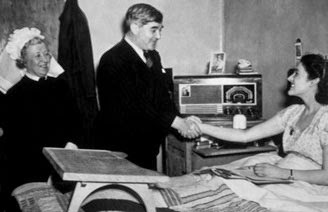 With the end of the war, and the creation of the welfare state, my father’s life would, thankfully, never be the same again. Marrying my mother, he then brought up his own family of four children – all born safely in NHS hospitals and well-educated in state schools - in a newly-built council house. During some periods of unemployment he was supported by the state; he never thought of himself as a scrounger – he was just glad that he could feed his family when times were hard. When he had a stroke in retirement, he recovered in a dedicated NHS stroke unit and, when he was diagnosed with cancer, spent his final days receiving the best care in an NHS hospice. Not quite 'from the cradle to the grave' for my father, but hopefully it will be for his children. Sometimes it pays to remind ourselves that the state we're in is worth defending.